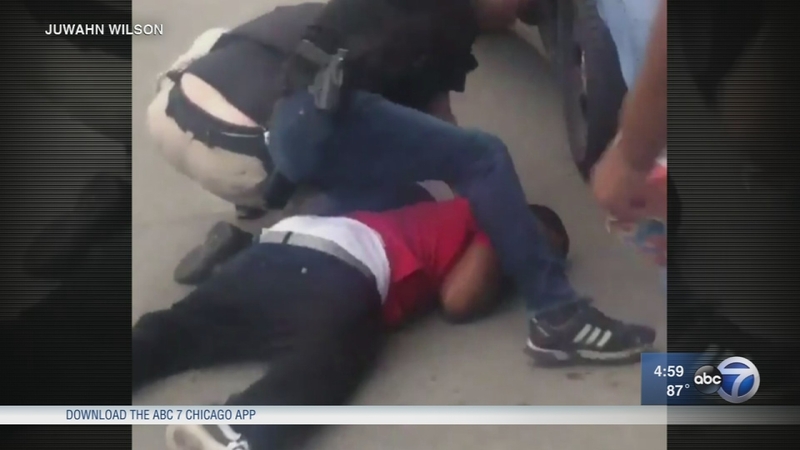 CHICAGO (WLS) -- The family of a man arrested in Chicago's West Englewood neighborhood said police used excessive force on him in an incident captured on cell phone video. Jermaine Milan was arrested at 70th and Wolcott. While he was on the ground, a number of people from the neighborhood surrounded him. While police kept them at bay, one bystander recorded the entire thing on cell phone. "He ain't trying to fight back, so they just started hitting him for no reason. He couldn't even do nothing. There was no need to do him like that," said Juwahn Wilson, Milan's brother. The video shows several officers taking Milan, 34, into custody. While he's pinned on the ground with several officers surrounding them, one of the officers can be seen striking Milan in the back of the head several times with his face against the asphalt. One of the officers can be heard telling Milan to "spit it out." It's unclear what the officer wanted him to spit out, but Milan was later charged with possession of a controlled substance as well as obstruction of justice, resisting arrest and assaulting an officer. His brothers, however, said they believe Milan is the one being assaulted. They want the officer to face justice also. "He should to be in jail, too. They regular people just like us. The only difference is they have a badge, we don't," Wilson said. Milan is being held on $70,000 bond. His brothers said they are speaking with attorneys about legal action against the Chicago police officer. Chicago police released a statement through their spokesperson, saying, "The Chicago Police Department takes the conduct of officers very seriously. We became aware of the video documenting plain clothes officers attempting to arrest a noncompliant offender after a suspected narcotics transaction last night. An investigation into the incident has been opened and the matter will be referred to the Independent Police Review Authority for a thorough review of the facts and circumstances of the incident." Fraternal Order of Police president Kevin Graham released a statement, saying, "Last night, plain clothes officers arrested two men in the seventh district for narcotics violations. The first offender complied with the officers' commands and was arrested without incident. The second offender, armed with a knife, refused to comply with officers. In order to maintain control and make an arrest, the officers used open-hand strikes on the offender. We believe the officers were clearly in compliance with general orders and the use of force policy. It is difficult to make such in an arrest in a hostile crowd. The officers did a good job."